I've made a few icons representing different categories like "park", "nature", "sanitation" etc. I'm now officially stuck on the icon for "other" or "miscellaneous". This icon is going to represent all other categories that don't have their own icon. Maybe an icon with three dots or something, but that doesn't feel clear enough. Any suggestions? The only restriction is that it can't be language specific (writing "Misc" or something). 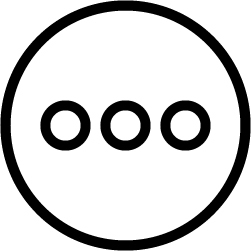 I know you asked for an icon that isn't language specific, but the idea of "other" is an abstract concept, and rather difficult to put into pictures. I can't think of anything specific that would cover that meaning exactly. Perhaps an ellipsis ... would work, certainly for languages which use the Latin alphabet. Technically, it represents an intentional omission rather than "other" - but the idea is somewhat similar. An arrow is also another possibility, in the sense of "next" or "another". Or if miscellaneous/other in the sense of "unknown", then perhaps a question mark. If in the sense of other options/menu items, then a hamburger icon ☰ might even work. I suppose the choice would depend on what it is being used for, which you haven't really mentioned. The actual symbol exists for what you want to identify and appears in the International Symbol Dictionary to indicate an otherwise unspecific (miscellaneous?) place of interest. Some interpret it as a view of a castle from above, while others trace its heritage to the Bowen knot. It was rarely used and fell into obscurity. It’s called the command key, the splat, the pretzel, the propeller, the cloverleaf, or the squiggly key: the cryptic ⌘ that Mac users tap ten times a day. The symbol is familiar yet cryptic, but like everything Apple, there’s a legend behind it. Apple chose the icon for this and appropriated it for their "Command" key to replace the logo originally appearing there. It was the familiar clover-leaf design. The Apple Command key (or, as you might better know it, ⌘) has a beautiful and clear history. Originally, the ⌘ key was an Apple symbol instead, but Steve Jobs thought that using the Apple logo as a keyboard shortcut in the original Macintosh’s menus was “taking the logo in vain” so he tasked the great icon designer Susan Kare to find a solution. The symbol she chose was the traditional clover symbol we all know today, chosen because it is commonly used in Scandavaniva to indicate a tourist attraction or place of interest. Since that's what it's for, use it. Why reinvent the wheel? Why create redundancy? Take back the design; it was grabbed from our legacy. Justice for all! maybe write 'otr' in a nice font?